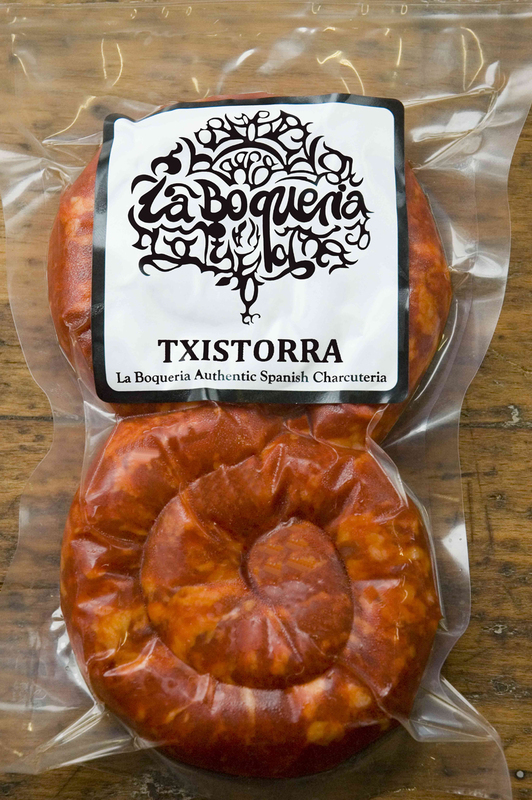 Txistorra (Basque) Chistorra is the most famous sausage from Spain’s Basque region. Keeping to the authentic recipe, it is made 50 centimeters long from Australian pork leg and a high percentage of pork belly in a natural 24 mm sheep casing. Txistorra (Basque) Chistorra is the most famous sausage from Spain’s Basque region. Keeping to the authentic recipe, it is made 50 centimetres long from Australian pork leg and a high percentage of pork belly in a natural 24 mm sheep casing. It is flavoured with garlic, salt, and paprika De La Vera, giving it a bright red colour and a smoky note. Recipe Notes Conventional Txistorra dish -Grilled txistorra served sectioned in smaller pieces as a Tapa -Fried sections, finished in a cazuela with a drizzle of cider Unconventional Txistorra dish -Grilled txistorra sections, chargrilled octopus tentacles,red and white witlof, Marcona almonds with a punchy salsa verde drizzle Tasting Notes VISUAL • Vivid red colour and overall rustic appearance • Once cooked and portioned it bursts with explosive pockets of sweet paprika flavoured juices TEXTURE • Initial good texture under tooth from coarse and even grind of pork belly, leg, and neck • Lasting medium to firm texture strength derived from the pork belly • Intensely juicy FLAVOUR • More sweet than savoury with medium paprika Smokey notes • Long-lasting and subtle sweet porky notes Packaging • 2 x spiral.